Lawyer Justice is built for Legal Advisers, Legal offices, Lawyers, Attorneys, Counsels, Advocates and other legal and law related services and it is suitable for any kind of legal and financial activity. Lawyer Justice comes with all the features required by a law site site like Practice Areas, Attorney Profiles, News, Gallery, Consultation and Booking forms, Honor & Awards, Event Management, Testimonials and multiple blog layouts. It has a responsive layout that looks great on mobile and tablet devices. Each and every available website component is 100% responsive and adapts perfectly for any mobile device. What ever you are using the device your site will run as it should be. 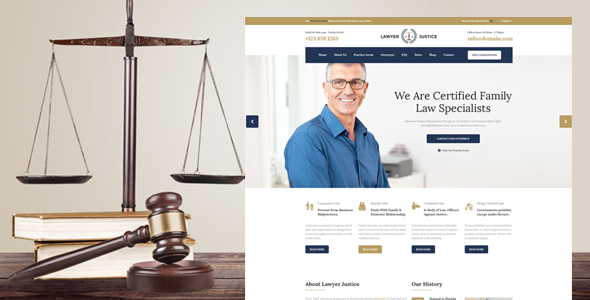 The Lawyer Justice template is fully responsive layout for all type of devices. The Lawyer Justice template coded with beautiful and clean codes! Some powerful HTML files 100% valid W3 web standards.